Find all possible ways to reach your destination using Confirmtkt Alternates.You can now reach your destination with comfort. Just enter source and destination and you will get the best available ways to reach your destination. Direct train to reach your destination. Not getting a direct train ? Switch 2 trains to reach your destination. 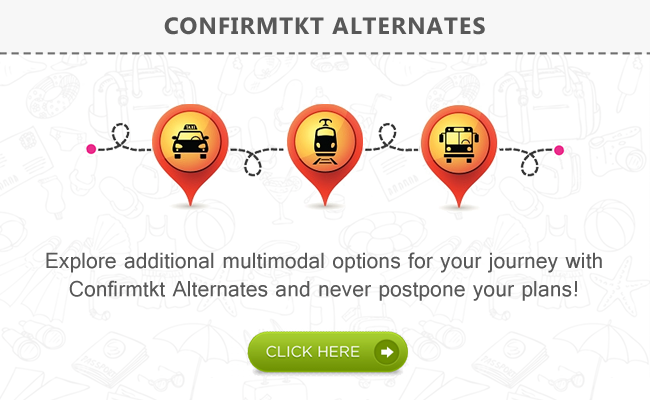 Travel by train upto certain distance and hop to take a bus to reach your destination. Take a direct bus instead of train. Best travel alternates between Chennai to Bangalore. Best travel alternates between Chennai to Delhi. Best travel alternates between Chennai to Mumbai. Best travel alternates between Chennai to Kolkata. Best travel alternates between Chennai to Hyderabad. You can now reach your destination with comfort. Just enter source and destination and you will get all possible ways you can reach to your destination by Train, Bus and even the combination of both. The best part is you don't have to be on waitlist any more! You just have to select the option "Only if seats are available" on Comfort tab on this page and you will get all the options with confirmed ticket.